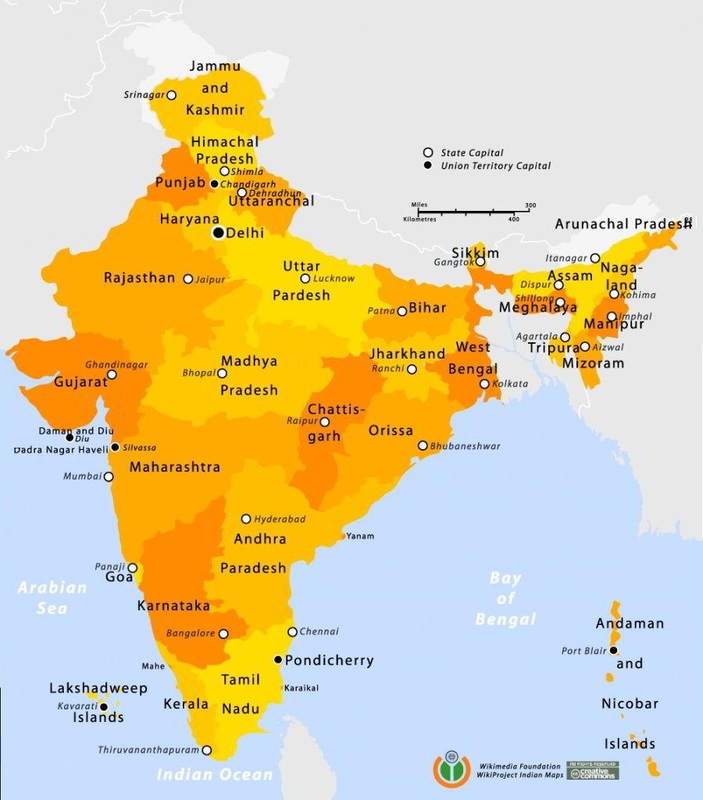 India is the fifth largest country in the world (3.29 million km2) and the second largest in terms of population (over 1 billion people), with a capital of Delhi. January 26 is the day of the national holiday (It is the day of the proclamation of the Republic). There are 18 official languages and hundreds of local dialects. 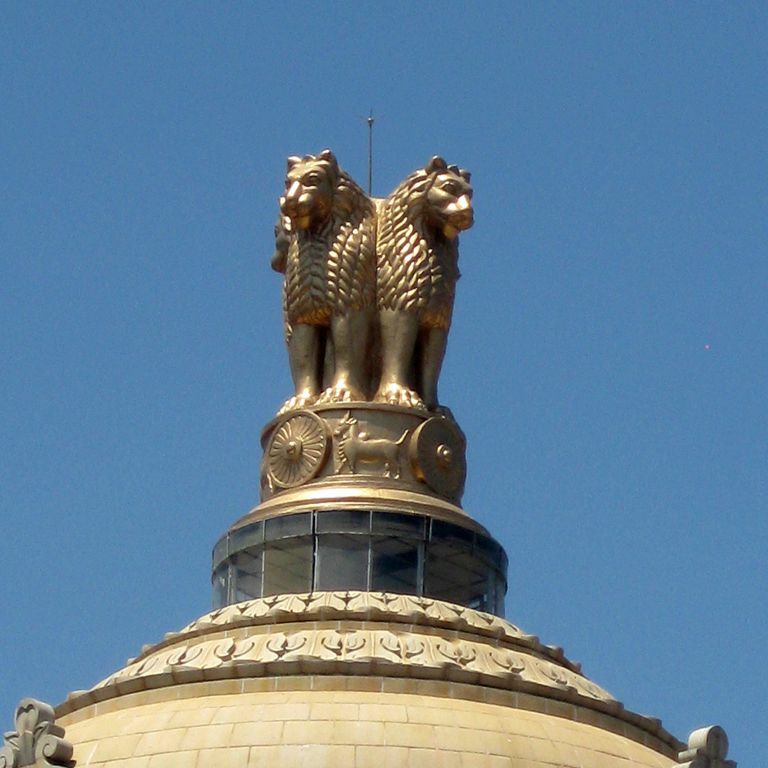 Politically there are two assemblies: the Lok Sabha (House of the People) whose members are elected by the people and the Rajya Sabha (Council of States) whose members are elected by state assemblies. The Prime Minister (Manmohan Singh - Congress Party - appointed in 2004) holds the real power. The President of the Republic (Mrs. Pratibha Devisingh Patil, elected in July 2007) has only an honorary role. The official currency is the rupee, divided into 100 paise. The national anthem, Jana-gana-mana, was composed from a poem by Rabindranath Tagore. The Indian flag is tricolor. It consists of three horizontal bands: orange, white and green. The wheel (chakhra) in the center of the white band is inspired by a drawing on the Ashoka column at Sarnath. 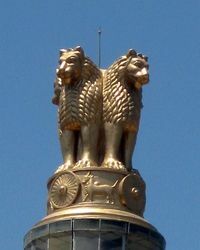 On this same column stands the emblem of modern India. They are four lions, sitting back to back and facing the four cardinal points. 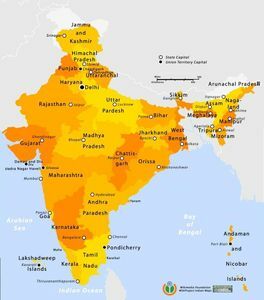 Hindi has been adopted by the constitution as the official language of the state, but the other languages have official status in the states where they are predominantly spoken: Assamese (Assam State), Bengali (West Bengal) Gujarati (in Gujarat), Hindi (Jharkhand, Haryana, Himachal Pradesh, Madhya Pradesh, Chhatisgarh, Rajasthan, Uttar Pradesh and Uttaranchal), Kannada (in Goa), Malayalam (in Kerala), Marathi (in Maharashtra), Oriya (in Orissa), Punjabi (in Punjab), Sanskrit, Sindhi, Tamil (Tamil Nadu) Telugu (in Andhra Pradesh), Urdu (in Jammu and Kashmir), Nepali, and Manipuri. The Himalayan chain to the north that separates India from China, Bhutan and Nepal. This is where the Kanchenjunga (8598 m) is located, the highest point in India. The northern plain stretching from the Oman Sea to the west and the Bay of Bengal to the east. It is formed by the basins of the Ganges, the Indus and the Brahmaputra. Bangladesh and Burma border this plain to the east, Pakistan to the west. With its 3000 km, the Ganges is the longest river in India. The climate of India is mainly governed by the monsoon. There are three main periods: a warm season, a wet season and a cool season. The warm season extends from mid-March to mid-May. It can be particularly unbearable, temperatures around 40 ° C. The wet season begins with the arrival of the monsoon. It is a regime of winds, there are two periods: the south-west monsoon from June to October which rises from the south to the north and the withdrawal of the monsoon from October to February which descends from the north to the south. The south-west monsoon brings three-quarters of the country's rainfall. 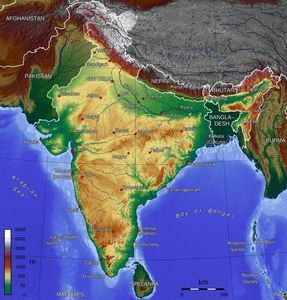 There are two branches: the first comes from the east and flows over to India from the west and the slopes of the eastern Ghats; the second comes from the south, the Gulf of Bengal, first flows into Bangladesh and eastern India before being diverted by the Himalayan range westwards to Punjab. The removal of the monsoon sees the inversion of the movements of masses of air. The dry continental air returns to the ocean. Precipitation is therefore low and discontinuous except on the southeast coast of the peninsula. The air was charged with humidity by passing over the Bay of Bengal and rains fell on the Tamil Nadu. The cool season begins in November and ends in March. It is the most pleasant season to live except in the great plains of the North where the climatic conditions can very rigorous. India has always been one of the most populous countries in the world, even in antiquity. Demography in the twentieth century was galloping due to the modernization of the country, to the improvement of health and social conditions and to vaccination campaigns. In 2003 the population estimate was 1,049,700,118 (32.2% of which were under 14 years of age). The fertility rate is still quite high (2.9 children per woman) and the life expectancy is 63 years for a man and 64 years for a woman. The population is very rural (more than 70%) but is distributed very unevenly. There are almost desert regions in India (Rajasthan), while others are overcrowded (valleys and deltas of major rivers). The largest city in India is Mumbai (formerly Bombay) with its 13 million inhabitants. Delhi has 8.5 million. Many cities have changed their name in recent years: Bombay became Mumbai, Varanasi became Varanasi, Madras became Chennai, and so on. The population density is about 280 inhabitants / km2, but it varies greatly from one state to another: from 70 inhab / km2 in Sikkim to 850 in West Bengal. India is one of the few countries in the world to have more men than women. This anomaly is due to the fact that many women abort when they are pregnant with a girl. This elimination of girls is explained by the fact that the dowry system still weighs heavily on Indian families. A girl, when she marries, has to pay her in-laws a dowry, more or less important, according to her husband's caste. The education of a girl can be very expensive for a family. 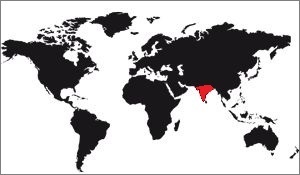 The Indians are distributed as follows: 72% Indo-European, 25% Dravidian and 3% Mongoloid or other. There are 81% Hindus, 12% Muslims, 2.3% Christians, 1.9% Sikhs, 0.7% Buddhists, 0.5% Jainas, and 0.4% others. Since its independence, India has introduced a mixed economy system. The government plays the role of planner, regulator, investor and producer. In 1998, the GDP was about 1700 billion dollars or 1700 dollars per inhabitants. India's economy depends heavily on agriculture, accounting for nearly 33% of GDP. Farmers represent 66% of the country's assets and 20% of the world's assets. The main food crops are rice, wheat, millet, pulses, some oilseeds. Cereals provide more than 60% of agricultural production. Major changes have been made with the introduction of highly productive hybrid seed varieties with the use of chemical fertilizers and pesticides. This is what we call the green revolution. The main cash crops are cotton (all over the country), tea (on the hymalayan slopes and in the south), coffee (in the south), rubber and coconuts (in the south-west). India is the biggest tea producer in the world. Due to religious taboos livestock breeding for slaughter is reduced. The animals are mainly used for milking, transporting and producing milk, wool and manure still widely used to fertilize the land. India is the largest producer of milk, ahead of the United States. Most of the forests are state owned and managed by their governments. Logging companies are licensed to forestry companies. A wide variety of minerals are extracted and exploited. The largest production is coal. It provides more than half of India's energy needs. The oil industry is in full development but it covers only half of the country's demand. India has developed a lot of hydroelectricity and this source accounts for 40% of the electricity produced in India. Indian industry has been developed to improve the living conditions of the population, especially in the consumer goods sector. This policy has not prevented India from developing advanced industry programs (aerospace, computing, nuclear, etc.). The industry has experienced a high growth rate, but production remains poor and often unsuitable for export. Textile manufacturing remains the most important form of industry in the country in terms of employment. India is one of the largest cotton manufacturers and exporters. In addition to producing steel via its large conglomerates (Tata Iron and Steel Company), India produces aluminum and copper. Metallurgy manufactures machine tools, automobiles, bicycles, buses, locomotives, engines, etc. India's railway network is the fourth largest in the world (63,000 km). The road network suffers from a long delay in planning (only a little more than 40% is paved). The automobile is little used. The Indian communication network is undergoing restructuring but is still suffering from its obsolescence. Postal services are widespread throughout the country but are slow.